This is the first of two articles on the state of adult education in California. The second piece will run on Wednesday, June 13. The sun was still melting through the gray morning sky as teacher Don Curtis rode his bicycle into a warehouse yard belonging to Oakland Unified School District, opened a large garage door, and backed his classroom into the parking lot. “It has taken some getting used to driving this vehicle, trust me. The big thing is the back end; when you turn, the back end swings out quite a ways,” said Curtis. But after eight years, he’s had plenty of practice driving the district’s 35-foot-long RV retrofitted with 12 computer workstations and a large screen for projecting lessons. The mobile classroom, run by the school district’s adult education program, fills several spaces on a busy street next to Oakland’s Urban Promise Academy Middle School. It’s also full on the inside, with nearly two dozen parents of Promise Academy students sitting snugly on chairs and stools in order to buddy up at the workstations, while Curtis teaches them the basics of computer literacy: setting up email, doing a simple web search, and navigating the parent information section of the district’s website. On the sides and front of the RV, painted in multicolored letters, is a sign reading “Sharing English Together.” But that tag line is archaic. Despite the high-tech equipment inside, the RV is emblematic of a threatened species, a relic of Oakland’s once thriving adult education program. The district’s program no longer offers English as a Second Language. It has also cancelled basic skills classes for adults who left school very young, often to work, and, at the other end, has dropped a high school diploma program for students who are a few credits shy of completion. A popular certified nursing assistant program is down to two sessions instead of seven, and two of the three schools have been closed. Until 2009, adult education was protected as a categorical program in California, meaning the money couldn’t be used for any other purpose. 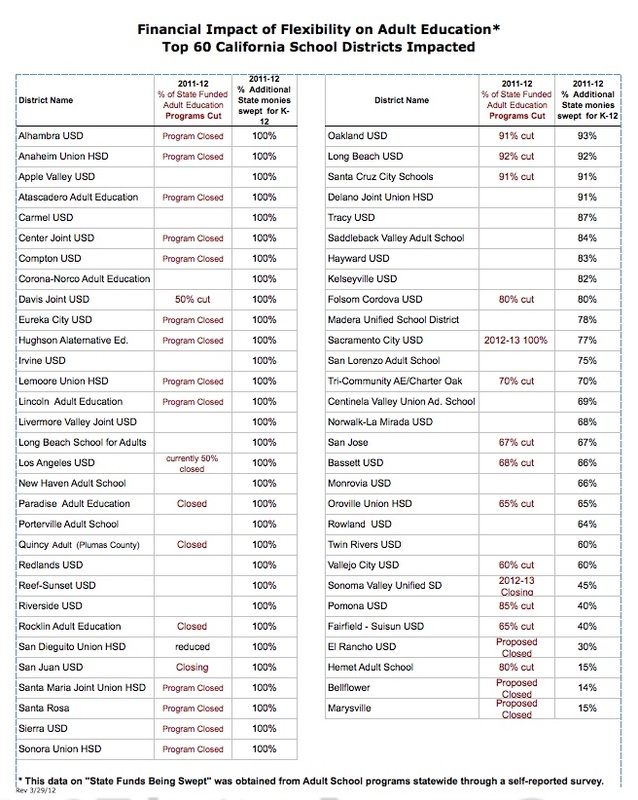 In February of that year, state legislators gave school districts permission to use funds from 39 categorical programs – including adult education – wherever they were most needed, and cut the budget for those programs by 20 percent. 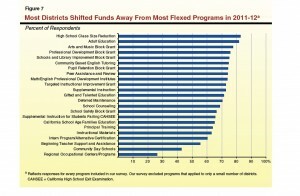 What districts did with categorical flex. (Source: California Legislative Analyst) Click to enlarge. Since then, local school boards have closed 32 adult education programs and cut at least half the funding for more than 40 others, according to a survey conducted a few months ago by the adult education administrators in Montebello Unified School District. 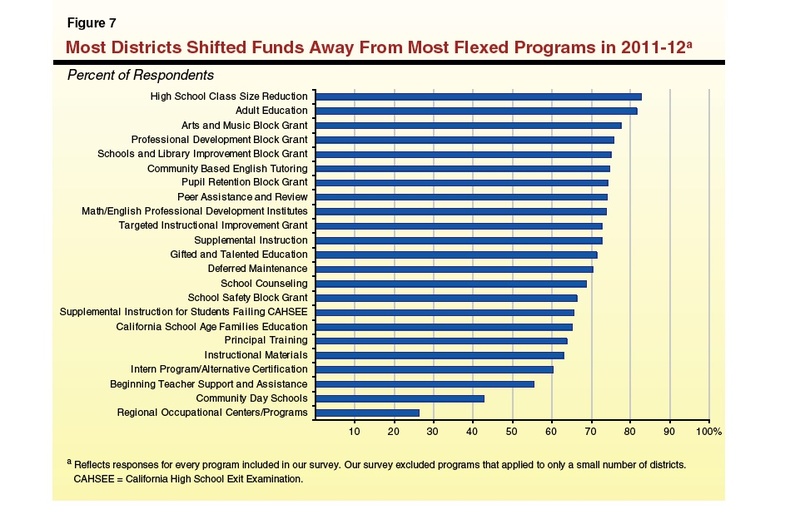 Later this week, EdSource will be releasing a new report and survey of how this categorical flexibility, or “flex” as it’s described, threatens to dismantle the nation’s oldest adult education program. 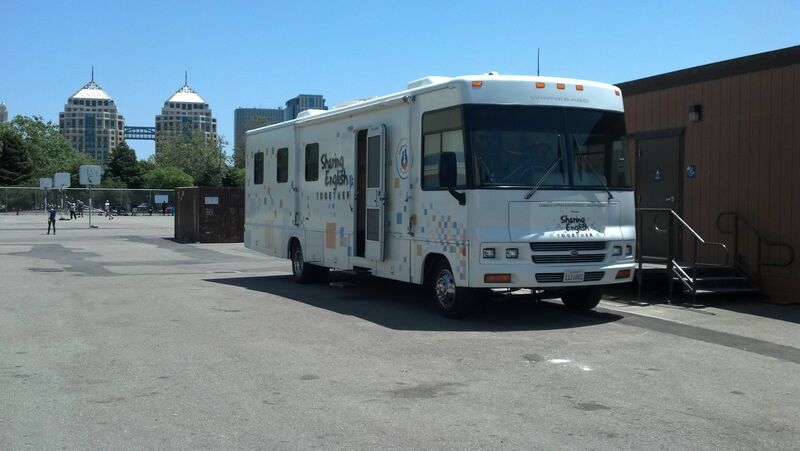 Oakland’s program was among the hardest hit, losing 90 percent of its funding. In the past three years, it’s dropped from $11.4 million to $1 million. During that same period, said Nelson, enrollment fell from 25,000 to 1,000 students, and all but a handful of the 300 teachers and staff members were laid off. Adult education in California started in 1856, when the San Francisco Board of Education sponsored evening classes in elementary and vocational education in the basement of St. Mary’s Cathedral, according to the 2005 book Meeting the Challenge: A History of Adult Education in California, published by the state Department of Education. 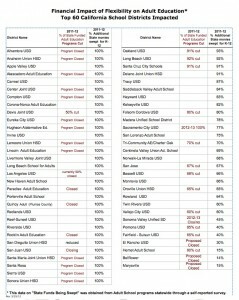 Adult Ed cuts and closures. (Source: Montebello Unified School District, Adult Ed program) Click to enlarge. Edgar Melchor first saw the mobile classroom when he brought his son to school. He has two children in the district and works at Whole Foods, the high-end grocery chain. Melchor said even though most of his work involves computers, his skills weren’t very good. 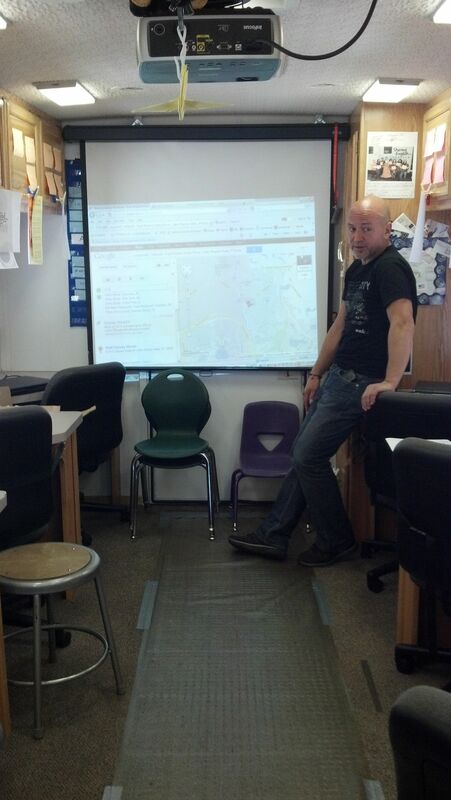 He has a computer at home that his children use, but as far as he was concerned it was just a decoration – until he enrolled in Curtis’ class. The class runs four days a week, it’s free, and there’s childcare in the middle school for parents with younger kids. “It helps me communicate better with [my children], because kids know a language we don’t know, the language of computers, and now I understand it,” said Melchor. “I help them every day with homework now.” And when he’s stumped, he emails Curtis. The district’s GED program is held in what’s known as a permanent portable classroom. It doesn’t travel, but on a spring morning it was shuddering as work crews pounded away at a nearby construction site. The noise didn’t seem to distract any of Carolyn Chin’s two dozen students as they practiced mathematical word problems. Chin is fervent about her work. Last summer, when it wasn’t clear whether she’d have a job in the fall, she held the class anyway, arranging to use her regular classroom. “My students wanted to maintain their momentum, so I wanted to make that happen for them,” she explained modestly. Her students are so loyal, they can’t seem to stop coming, even when they’ve completed the class. 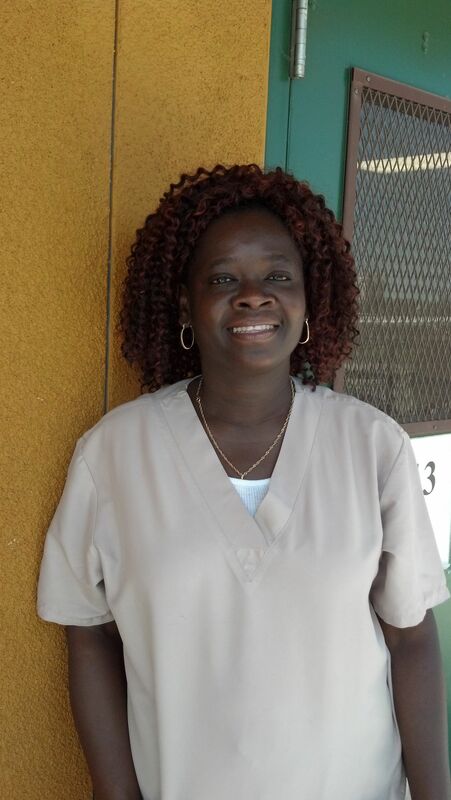 Florence Edwards already passed the GED exam, took the certified nursing assistant class, works full time, and has enrolled in a nursing program at Merritt College for the fall semester. None of that has kept the recently naturalized immigrant from Ghana from showing up regularly in Chin’s class. “I always come here on my break time, I come here to refresh my mind,” said Edwards. Perez is a cook in an Italian restaurant in San Francisco and will study to become a chef next September at City College of San Francisco. But his future was uncertain at the end of the last academic year when all the teachers were laid off shortly after he started in Chin’s class. His nightmare was that the district would stop offering GED courses. “Now I’m going to say keep this open, the GED, because I think everybody deserves a second chance,” said Perez. A lot of people in Oakland need second chances. About 30 percent of the adult population are considered functionally illiterate and 21 percent don’t have high school diplomas – higher in some neighborhoods. None of this is lost on the school district, but its primary mission is K-12 education and those schools have been cut so much that there was little question about appropriating the flex funds. 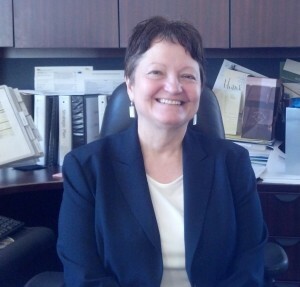 “These are tough decisions in terms of which programs need to be reduced, schools to close, so that we can actually function, deliver a quality program for all of the students and also be fiscally solvent,” explained Deputy Superintendent Maria Santos, who oversees adult education in Oakland Unified School District. She acknowledged that those decisions aren’t made in a political vacuum. “I think some of the critical considerations that come to mind are what we’re held accountable for,” said Santos. That means ensuring that students improve their scores on statewide achievement tests, that they meet academic standards and increase their graduation rates. The district is hoping to offset some of the cuts to adult education by developing partnerships with local community organizations and community colleges, funding ESL classes through a different categorical account, and making sure that alternative programs like continuation schools are utilized to their fullest. ENDING California’s Public Adult Education Through Policy: Will you let it happen? 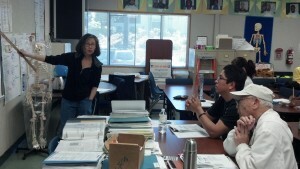 California Federation of Teachers, April 13, 2012. 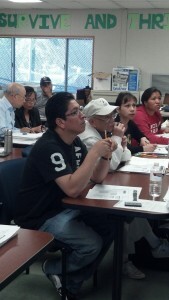 Linking Adults to Opportunity: Transformation of the California Department of Education Adult Education Program. CDE’s Strategic Plan. 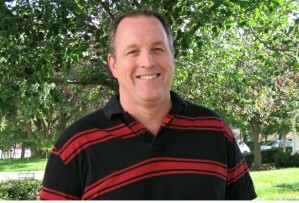 Nov. 2011. Workforce Investment Act, Title II Adult Education and Family Literacy Act, California State Plan, 1999-2004, extended through 6/30/12.